In November 2017, Professor M.J. Bonell, at the invitation of the Law Faculty of the University of Würzburg (Germany), for the second year held a 4-weeks Postgraduate Course on “International Commercial Contracts in Europe and Worldwide (Domestic Law vs. Uniform Law)", focused on a comparison between the contract laws of the U.S. and of a selected number of European countries on the one side, and the CISG and the Unidroit Principles on the other, with special references to relevant court decisions and arbitral awards reported in the UNILEX data base. On 23 February 2016, the President of UNIDROIT, Mr Alberto Mazzoni, made a presentation at an event entitled “Could the UNIDROIT Principles solve the battle between Common Law jurisdictions and other jurisdictions in international arbitration? If so, how?” and organised by the Stockholm Centre for Commercial Law at Stockholm University. On 3-4 March 2016, at the kind invitation of the Faculty of Law of the University of Oslo, an event entitled “UNIDROIT Principles of International Commercial Contracts: Issues Relating to Long-Term Contracts” was held in Oslo, at which the recommended amendments and additions were the subject of lengthy and fruitful discussions. On 14 March 2016, Mr Giorgio F. Colombo, Assistant Professor at the Graduate School of Law at Nagoya University, Japan, held a lecture on “The Role of UNIDROIT Principles of International Commercial Contracts in Legal Education in Japan: Some Practical Remarks” in the context of the “UNIDROIT Lectures: Perspectives from Japan” held at the seat of UNIDROIT. Jointly organized by the International Federation of Consulting Engineers (FIDIC) and the International Chamber of Commerce (ICC), the annual Conference on International Construction Contracts and Dispute Resolution took place in Istanbul on 29-30 March 2016. This conference was part of the continuing effort of the ICC and FIDIC to promote better construction and more efficient dispute resolution around the world. On 15 April 2016, the President and the Secretary-General participated in an event entitled “Practicing International Law at the United Nations” and organised at the seat of UNIDROIT by the Secretariat and the Italian Society for International Organization (SIOI) as part of UNIDROIT’s 90th Anniversary Celebration Series, at which inter alia the importance of the UNIDROIT Principles was discussed by the panellists and participants. Six video-linked locations: On 25 February 2015, a two-hour programme on “The 2010 UNIDROIT Principles of International Commercial Contracts” took place in New York, London, Paris, Berlin, Frankfurt, and Washington D.C. It was organised by the New York Branch of the Chartered Institute of Arbitrators (CIArb) and Squire Patton Boggs, in association with ICC/SICANA, Inc., New York International Arbitration Center (NYIAC), the College of Commercial Arbitrators (CCA), and the CIArb European Branch and Washington D.C. Chapter. The programme was introduced by Peter Michaelson, Chair of CIArb New York Branch, and moderated by Richard Mattiaccio, the Squire Patton Boggs partner and Chair of the Programming Committee of CIArb New York Branch who organised the program. M.J. Bonell (UNIDROIT), E. Brödermann (Hamburg), N. Cohen (New York) B. Fauvarque-Cosson (Paris), H. Gabriel (Greensboro, North Carolina) and A. Garro (New York) made presentations on specific topics and answered questions from an audience composed of experts in international commercial law and disputes. Speakers and participants were connected through video-conferencing between six Squire Patton Boggs offices. Additional participants from all around the world followed the live programme online. It was the occasion for a lively introduction to key provisions and to the actual and potential use of the UNIDROIT Principles in cross-border commercial disputes and in the development of commercial law in civil, common law and developing legal systems. The multi-location programme attracted approximately 150 participants and reflected growing interest in the 2010 UNIDROIT Principles on both sides of the Atlantic. Seminar at University of Tehran: On 25 November 2014, the Secretary-General participated in a Seminar entitled “Unity of National Laws in the view of 1388 as a year of Renewal - UNIDROIT - Background of the Institute and the ways for mutual collaboration” organised by the University of Tehran with the support of the Ministry of Foreign Affairs of the Islamic Republic of Iran. Dr. F. Mousavi, the Dean of the Law School of the University of Tehran, opened the seminar and delivered the welcome address, which was followed by an introduction to UNIDROIT and its work by Prof. Laya Joneidi of the University of Tehran. The Secretary-General delivered a lecture on the UNIDROIT Principles of International Commercial Contracts, their purposes, contents and practical use. Dr. Behrooz Akhlaghi, a member of the Working Group that prepared the UNIDROIT Principles, and Dr. Quassem Zamani, who also contributed to the Persian translation, introduced the publication to the audience. Dr. Majid Poorostad, whom UNIDROIT had tasked with the Persian translation of the ALI/UNIDROIT Principles of Transnational Civil Procedure, in turn, introduced this publication to the public. Prof. Said Habibia delivered the closing remarks. While in Iran, the Secretary-General was also received by H. E. Dr. Masoud Soltanifar, Vice-President and head of Iranˈs Cultural Heritage, Handicrafts and Tourism Organization (ICHHTO) and by H. E. Dr. Elham Amin Zadeh, Vice-President of Legal Affairs of the Islamic Republic of Iran, with whom he discussed aspects of the work of UNIDROIT of particular interest for the country. The Secretary-General, in addition, visited the University of Tehran and University of Judicial and Administrative Sciences in Tehran, and the University of Isfahan. For more information about the UNIDROIT Principles of International Commercial Contracts and the ALI/Unidroit Principles of Transnational Civil Procedure, see http://www.unidroit.org/overview-principles-2010 and http://www.unidroit.org/transnational-civil-procedure-overview respectively. Twenty years UNIDROIT Principles: A conference celebrating the twenty years of the UNIDROIT Principles on International Commercial Contracts was held in Rome, 9 – 10 May 2014. The speakers dealt with The role of the UNIDROIT Principles in international contract practice (K.P Berger, F. Bortolotti, H. van Houtte); The UNIDROIT Principles and international investment contracts (P. Bernardini, G. Cordero-Moss, J. Kleinheisterkamp, A. Reinisch); The application of the UNIDROIT Principles in International Commercial arbitration (J. Bosco Lee, Y. Desains, H. Grigera Naon, H. Kronke, F. Mazza) and The UNIDROIT Principles as a means of interpreting domestic law (M. Bridge, M. Malaguti, R. Michaels, C. Ramberg). The acts of the Conference will be published in the Uniform Law Review. Launch of Arabic version of 2010 UNIDROIT Principles: On 23-24 March 2014 a conference on the launch of the Arabic version of the 2010 UNIDROIT Principles was held at the Sultan Qaboos University of Muscat, Oman. 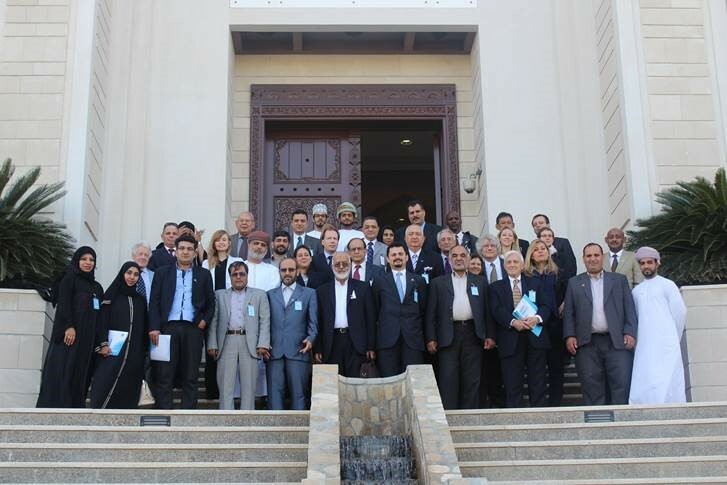 The conference, which was held in English and Arabic, was supported by the Johns Hopkins University and The Protection Program, and organised in collaboration with the Sultan Qaboos University and UNIDROIT. On 18 January 2013 an international Symposium entitled “Assessing the CISG and Other International Endeavors to Unify International Contract Law: Has the Time Come for a New Global Initiative to Harmonize and Unify International Trade?” was organised at Villanova University School of Law (Pennsylvania, United States of America). A. Veneziano represented UNIDROIT and presented a paper on “Pros and Cons of the Soft Law Approach to the Unification of International Commercial Contract Law in the UNIDROIT Experience”. H. Gabriel also made a presentation on the subject entitled “UNIDROIT as a Source for Global Sales Law”. The Acts of the Symposium were published in the Villanova Law Review 2013, volume 58 number 4. On 8 April 2013, M.J. Bonell was invited to attend the 28th ICC/SIA Joint Symposium of Arbitrators in Paris entitled “Interpretation of the contract by arbitrators” and to present a paper on “Implied Terms, Good faith and Arbitration”. In this context he referred to the relevant provisions of the UNIDROIT Principles as well as to decisions rendered world-wide applying theses provisions. On 13 May a group of Russian lawyers, accompanied by A. Komarov, met at UNIDROIT. Presentations on the Institute´s Work Programme in general and on the UNIDROIT Principles in particular were made by M.J. Bonell and A. Veneziano. On 8 November a joint UNIDROIT/ICC-Italia/Associazione Italiana per l’Arbitrato Conference on “Innovative Solutions for the Choice of the Law Governing International Contracts” was held at UNIDROIT. M.J. Bonell presented a paper on the newly adopted Model Clauses for the use of the UNIDROIT Principles, while F. Bortolotti, Chairman of the ICC Commission on Commercial Law and Practice presented a paper on the ICC Model Contracts and the reference to the UNIDROIT Principles therein contained. The two presentations were followed by a Round Table discussion on “The growing acceptance of a-national solutions in international contracts, particularly by developing countries, chaired H.E. Ercüment Erdem, Vice-Chairman of the ICC Commission on Commercial Law and Practice, with the participation of A. Montanari (FATA), S. Catelani (DuPont de Nemours), E. Marcenaro (ENEL) and P. Galizzi (ENI). On 28 and 29 November 2013 J.A. Estrella Faria and A. Veneziano participated in the Workshop “Private Production of Transnational Law” organised at the European Law Institute in Florence, discussing, inter alia, the role of the UNIDROIT Principles as a source of law in international commercial contracts. In the course of 2013 A. Veneziano gave two lectures on the UNIDROIT Principles: one on 12 June in the context of the Certificate Program on International Commercial Law and International Alternative Dispute Resolution – Pace Law School (on-line lecture) and another on 20 September in the context of the Master in Business and Company Law. European and international perspective at the LUISS University, Rome. Furthermore, a Conference on "Principes d´UNIDROIT (2010) : Un outil indispensable dans la négociation et la rédaction de contrats commerciaux internationaux was held on 21 March 2012 at the Court of Appeal of Quebec in Montreal, under the patronage of the Chief Justice of the Court of Appeal of Québec, the Hon. Nicole Duval Hesler. >>> Programme [link a: http://conferenceunidroitmontreal.wordpress.com/]. The Annual Colloquium of the Association Française des Docteurs en Droit on: "Les Principes d´UNIDROIT 2010 : une nécessité dans les contrats internationaux" [The UNIDROIT Principles 2010 : A necessity in International Contracts] was held at the Grand´Chambre of the Cour de Cassation in Paris (France) on 10 February 2012). On 24 May 2011 a seminar was held in Brussels at the Belgian Centre for Arbitration and Mediation (CEPANI) on the topic “UNIDROIT Principles of International Commercial Contracts (2010) and arbitration”, with presentations by M. Fontaine, J. Erauw, M. Piers, I. Claeys, D. Philippe and J. Kleinheisterkamp.